Features: These are the wear-with-everything earrings for this season. Bright, bold earrings to boost your wardrobe with versatility and style. A true rainbow design, playful and cheerful. Very light and easy to wear. 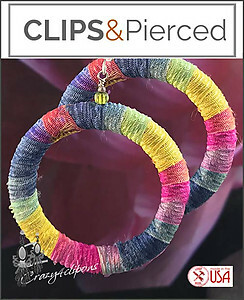 Specs: Wood based earrings, tie-dye fabric, glass beads, sterling silver wire.